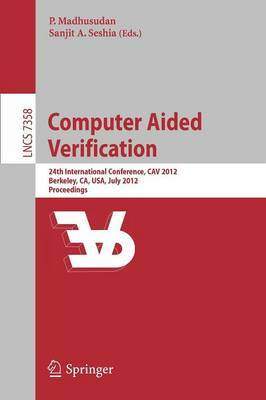 This book constitutes the refereed proceedings of the 24th International Conference on Computer Aided Verification, CAV 2012, held in Berkeley, CA, USA in July 2012. The 38 regular and 20 tool papers presented were carefully reviewed and selected from 185 submissions. The papers are organized in topical sections on automata and synthesis, inductive inference and termination, abstraction, concurrency and software verification, biology and probabilistic systems, embedded and control systems, SAT/SMT solving and SMT-based verification, timed and hybrid systems, hardware verification, security, verification and synthesis, and tool demonstration.